Check out our full review of the very existing Google Nexus 10 tablet. We’re not sure why this video wouldn’t be extended into something mildly satisfying, but as it is, we have a five second video of the Nexus 10 in action. The latest Nexus tablet was set to be announced at Google’s event on October 29, since cancelled due to Hurricane Sandy. 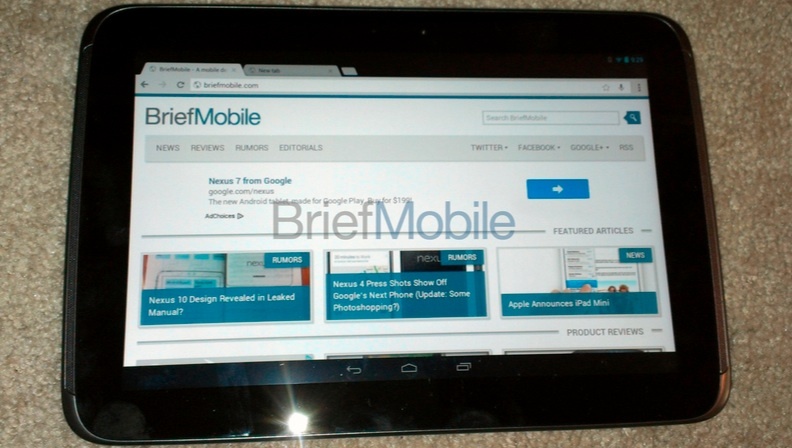 BriefMobile, an organization responsible for previous Nexus 10 leaks, posted the video. It doesn’t show much, but exists more as additional proof to the 10-inch tablet’s existence. Unfortunately, it’s still kind of goofy looking with an overly rotund appearance. The video’s length is definitely odd (we can’t get over it) and if anyone knows why it had to be this short then please tell us. NFC is on-board as is typical of a Google device. The camera is allegedly 5-megapixels and Android 4.2 will be preinstalled, still carrying the Jelly Bean title. We covered some rumors surrounding Android 4.2 earlier, said to bring multiple user accounts and quick settings in the notification tray. What do you think of Google’s latest Nexus tablet? Do you prefer it to the iPad?